Uber is a rideshare company that provides rides to individuals or groups to help them get to the desired destination. Uber has not only made it possible for the general public to receive easier transportation around their communities but those in wheelchairs can also benefit from this app. Wheelchair users can now access transportation in the majority of locations with certified drivers who can properly assist them with their ride. Many are unaware of this option when traveling which can limit them. It's extremely easy to access Uber through your phone as well as very affordable and convenient for many. 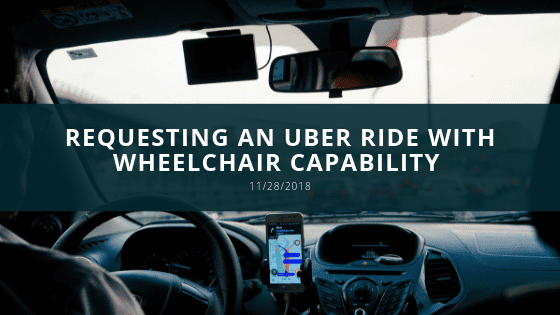 Requesting a wheelchair capable Uber ride is like to requesting a ride for any other. To begin, you must download the application on your smartphone. Once the application is downloaded, it's time to create your account. When creating your account, the app will request personal information such as your name, phone number, and email address. Once that information is submitted a payment method must be submitted. You may enter a credit card, Paypal, Venmo, Uber gift card, or purchase Uber Cash. When the account is created, you are asked to read and accept the app's terms and policies. The tab on the home screen will ask “Where too?” and that is where you type in your intended destination. When typing the address of the desired location, a tab above will typically auto-fill with your current location. The driver will pick you up at that specific location unless you change the pick-up location. You can change this by typing the location where you want to get picked up. Before you're picked up, you must choose your type of ride. They have four categories to choose from which are Economy, Premium, Extra Seats, and More. To access the different categories, you swipe left or right. For wheelchair users, you would swipe right to More and select WAV (Wheelchair Accessible vehicle). With WAV, a certified driver will pick the rider up in a vehicle with a ramp and proper safety features specifically for your wheelchair. Are other riders able to ride with the person in the wheelchair? Yes?, they can as long as there are seats and seatbelts for each. How much does it cost to get this service? The price is calculated automatically and factors like the time of request and availability influence the price. The person requesting the ride can see the price before the request. How to report dangerous driving? There will be an option at the end of the ride where individuals can report any issue to improve the quality of the ride. How friendly is your country to wheelchair users?